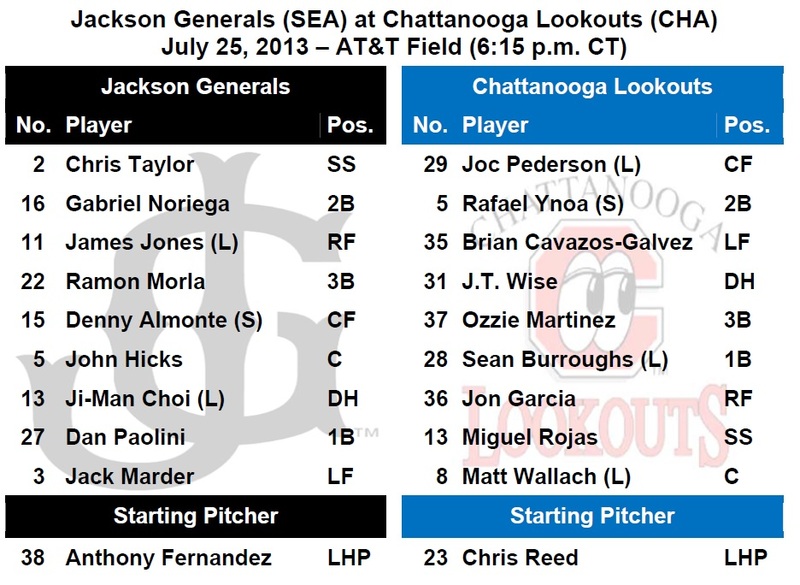 TODAY’S GAME: the Generals continue a 5-game road series tonight with game #3 at AT&T Field against the Chattanooga Lookouts…the Generals are 7-5 against the Lookouts this season and 5-2 at AT&T Field…23-year-old Anthony Fernandez makes his 15th start of the year, 91st of his career and 28th for the Generals tonight…In 3 starts in July, Fernandez is 0-2 with a 2.00 ERA (4ER/18.0) and opponents are hitting just .150 against him. GENERALS RECAP: Starter Roenis Elias struck out 10 and CF James Jones added 3 hits as the Generals won their 2nd game in a row over Chattanooga, 4-3 on Wednesday night. Jones (3-5, HR, 2 RBI, 2 R, 3B) 3B Ramon Morla (2-5, HR, 2 RBI, R) provided six of the eight Jackson hits and all 4 runs. 1B Ji-Man Choi (2-3, 2B) was the only other batter with a base hit in the Generals’ lineup in his second straight multi-hit game. The pitching was sharp behind Elias (W, 6-8, 2.99), as relievers’ Stephen Kohlscheen (2.85), Nick Hill (2.27) and Dominic Leone (0.00) blanked Chattanooga over the final 4 frames. 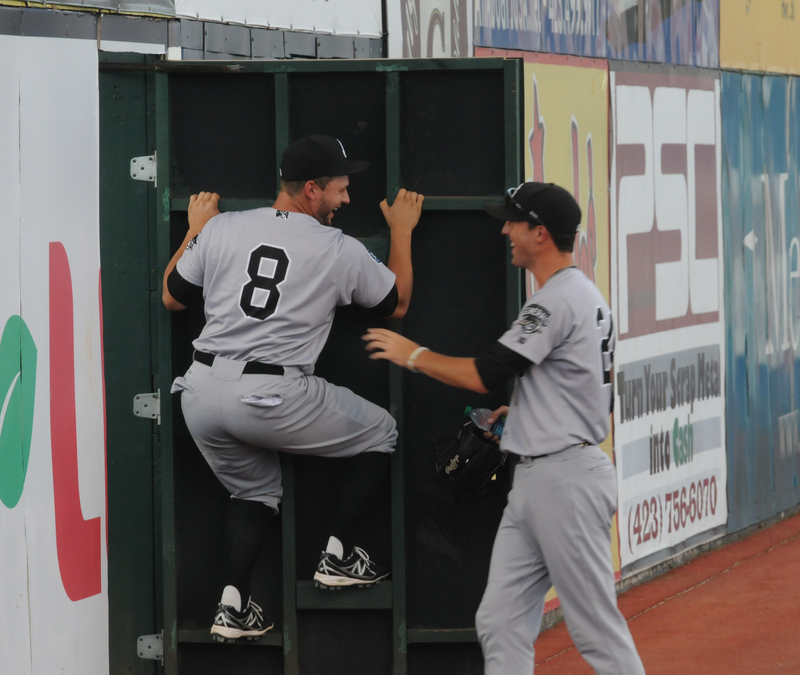 NEWS & NOTES: 37 of first 95 games have been 1-run games (15-22) which is the 5th in all of minors…52 of 95 games have been decided by 2-or-fewer runs (19-33) and 12 have been extra-inning games (4-8)…In games decided by 3+ runs the Generals are 24-18. • ALUMNI REPORT: Tacoma OF Stefen Romero has hit safely in 16 of his last 19 games, batting .303 (23×76) with 11 runs scored, 7 doubles, 1 home run, 14 RBI, 4 RBI and 1 stolen base. • TRIPLES ADDING UP: OF James Jones recorded his league-leading 10th triple on Wednesday. He is one triple away from tying the franchise record. Jones is tied with Richard Lewis (10, ‘04) and Chris Walker (10, ‘06). Dwaine Bacon (11, ‘04) and Bo Porter (11. ‘98) are leaders. • TAYLOR ADDING UP THE HITS: SS Chris Taylor recorded his 100th hit of the season on June 30 vs. Birmingham. He was the first Mariners farmhand to record at least 100 hits. Taylor is batting .316 (24×76) with 14 runs scored, 4 doubles, 2 triples, 1 home run, 7 RBI, 13 walks and 4 stolen base in last 19 games. During this 19-game stretch, since June 29, Taylor has raised his average with Jackson from .172 t0 .284 and has the 5th-highest average in the Southern League. • WE GOTCHA! !...Jackson catchers lead the SL catching 54.2% of base stealers (52 CS, 96 Att). The next closest is Birmingham which is throwing out 36.0% of base runners.